Looking for Teeth Whitening in Eustis? Yearning for a bright youthful smile? Dr. Barr offers a full range of cosmetic dentistry including professional teeth whitening. Teeth whitening is the #1 requested and performed cosmetic dental procedure. Teeth whitening (sometimes called teeth bleaching) is a procedure that brightens teeth and helps to remove stains and discoloration. Teeth whitening supervised by a dental professional is important to make sure it is safe. For example, cavities need to be treated before teeth are whitened. Cavities are problematic because the whitening solution can penetrate the cavity allowing decay to reach inner areas of a tooth. We can provide people with good dental health customized trays and a kit to whiten teeth at home. Whitening your teeth at home often involves using a custom fitted mouth guard into which a whitening solution is placed. These custom fitted mouth guards will help protect your gums from irritation that occurs while using ill-fitted over-the-counter whitening mouth pieces. After the solution is placed in the mouth guard, it is placed over the teeth and left on for a few hours or overnight depending on the type of whitening solution. Ask Dr. Barr if home whitening is right for you. In our office we offer the Zoom Teeth Whitening system which can whiten your teeth up to eight shades lighter in about an hour. The in-office procedure uses higher bleaching concentrations to produce faster, more dramatic whitening results in a very safe, controlled procedure. A special whitening lamp is used to activate the whitening gel for approximately 60 minutes. You will also receive the custom bleaching trays to continue your bleaching at home or for future touch ups. Zoom is only available at a dentistâ€™s office to ensure optimum safety, and comes in different treatment types and strengths to fit your lifestyle and sensitivity. 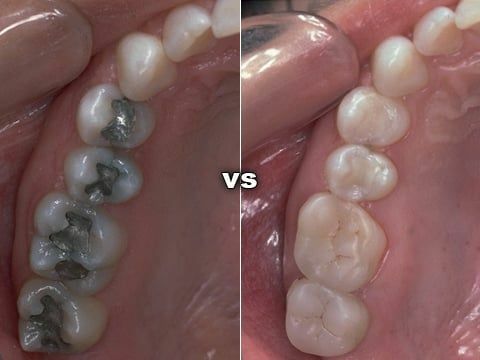 In order to make a filling appear almost invisible to the naked eye, composite fillings are often used. These fillings are designed to match your natural tooth color and are bonded to your teeth, which makes them less likely to fall out. These fillings are used to replace older fillings made of silver or gold. Tooth colored fillings have a more aesthetic appearance, can be completed in one visit, form a strong seal and are less likely to crack a tooth.